As a young professional entering my late 20s, a common debate among my friends and colleagues is the decision: continue renting or purchase a home? Whether that home is an apartment or a house, the rent-versus-buy decision is a financial commitment that will impact your spending and life plans now and into the future. For generations like the baby boomers, buying property was the next step in young adulthood. 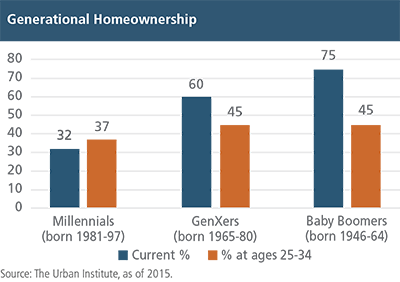 This is still true today, but the data below shows how homeownership among millennials has dropped compared to previous generations. Student debt — College graduates are entering the workforce with record high levels of debt due to the rising cost of education in the United States. With a chunk of every paycheck going towards student loans, it is difficult for many millennials to save money for a down payment or qualify for a home loan. Delaying marriage — Millennials aren’t as eager to get hitched as their parents and grandparents. As a result, it takes a single salary earner longer to save enough money for a down payment. Affordability — Young professionals are drawn to urban areas because they provide great career opportunities. That said, many of these metros, such as San Francisco, New York and Boston, are expensive real estate markets. Unfortunately, there is no crystal ball to determine the best decision for you given the countless variables that need to be considered. That said, here are a few of the major factors that you should consider when analyzing the tradeoff between renting and buying. Does renting or buying match my lifestyle? Purchasing a home is most likely the largest financial investment you’ll ever make. Therefore, it is important to consider all facets of homeownership and how they fit into both your personal and professional life. Flexibility — Renting provides you with the flexibility to move at short notice with little financial consequence. Homeowners don’t enjoy this same luxury, as selling a property at an inopportune time may not only take a while, but it might also be costly. Therefore, when evaluating your options, it’s important to consider how long you plan to stay in an apartment or house. This calculator from smartasset.com is an interesting and insightful analytical tool I’ve used to compare the break-even points between renting and buying. Generally, depending on factors such as the home price, down payment, interest rate and income, an expected home appreciation rate is required to tilt the odds in favor of buying a home. Job security — The cost of homeownership is expensive, therefore it is important to have a reliable paycheck to cover the expected and unexpected costs. Maintenance — Generally, renting is a breeze with little or no required maintenance by the tenant. Homeownership is a different story. You are your own landlord, meaning you will be tasked with any upkeep on your property or will pay out of pocket for any repairs and services you may need. The costs associated with renting are straightforward. You pay a monthly rental check and, depending on the place, may have to cover utilities and other services. The costs associated with owning a home are a bit more complicated and may come as a surprise to some. “A key concept is to carefully compare the after-tax cost of renting to the after-tax cost of home ownership,” advises Tom Tracy, Chief Client Officer at Aspiriant. Insurance — As a renter, you can purchase renters insurance to cover the contents within your apartment or home, which is inexpensive. As a homeowner, you’ll purchase homeowner’s insurance, which is priced depending on the size and location of your property. Areas that are subject to adverse weather and climate conditions, such as wildfires and hurricanes, will be more expensive. Property taxes — Unlike renters, homeowners pay a tax to state and local governments. The yearly tax is used to fund community costs, such as infrastructure, public safety and public schools. Municipalities determine the tax by assessing the value of your home. The national average for property taxes is 1.19% of the assessed value, but it varies depending upon your state and local government. Maintenance costs and HOA dues — As a homeowner, you’re tabbed with covering any maintenance costs on your home and property. These costs can be significant depending on the location and age of your home. Repairing a roof or replacing a water heater can put a major dent in your savings. Certain residential properties, mostly condominiums, also require homeowner association (HOA) dues to pay for maintaining and improving the property’s common areas. Utilities and services — In certain apartment complexes, utilities are covered in your rent. But as a homeowner, you’re responsible for gas, water, electricity, etc. Building equity — As a homeowner, every time you pay down principal on your mortgage you are purchasing a greater percentage of your home. Real estate, like financial assets, can and historically has increased in value over time. In a sense, it’s like forced savings. This is a significant benefit compared to renting, for which you receive no long-term value. Tax incentive — Historically, the tax code has provided incentives to homeowners by allowing deductions for home mortgage interest and property taxes. Unfortunately, the 2018 tax reform curtailed these deductions and, for more expensive homes, increased the after-tax cost of home ownership. However, homeowners can still deduct mortgage interest on a new loan of up to $750,000, which was decreased from $1,000,000. Likewise, they receive a deduction for property, state, and local taxes up to $10,000. Own your place — Tired of answering to your landlord? As the owner, notwithstanding HOA regulations, you decide when your home receives a facelift and you make all the rules. Relatively stable costs — Once you lock in a mortgage rate, your annual costs (aside from unusual maintenance expenses) is reasonably constant. Renting costs can shift substantially higher over time. Fewer upfront costs — Renting doesn’t require the large financial commitment owning a home does. Invest elsewhere — Instead of spending on a down payment, renters can invest in other assets and build a more diversified portfolio. Flexibility — Renters benefit from shorter commitments and the ability to move around. No maintenance — Saves you money and time. Rising interest rates — Given the current macroeconomic climate, securing a mortgage has become more expensive. Overpriced housing market — Real estate prices have steadily increased since the global financial crisis, especially in coastal states and urban cities. These last two factors, however, could be temporary. “Over time, interest rates and home prices ebb and flow with changes in the business cycle. So sometime in the future, lower financing costs or home prices may improve the financial case for buying,” explains Tom. Buying a home is a major financial decision, one that should be considered as part of a long-term financial plan. To help you make the right choice on whether and when to buy a home, we recommend consulting with a wealth manager or tax advisor. How Does Aspiriant Celebrate the Holidays?